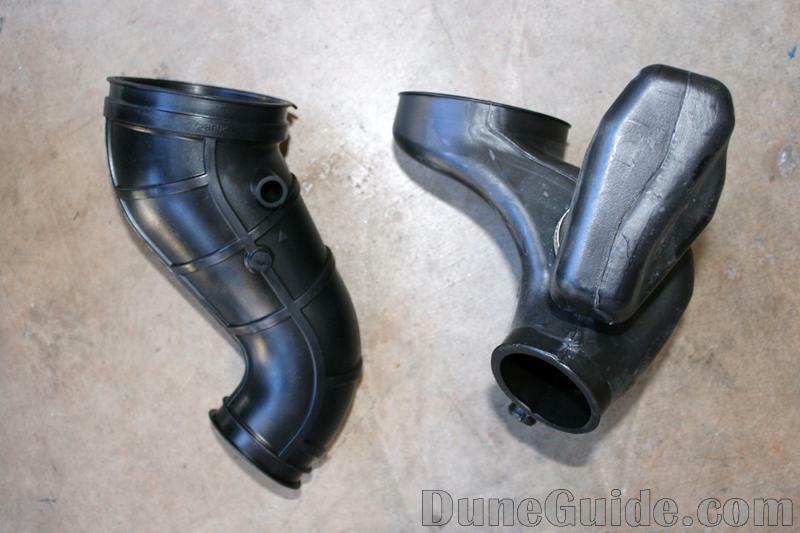 The stock KFX450R intake is very restrictive (left). 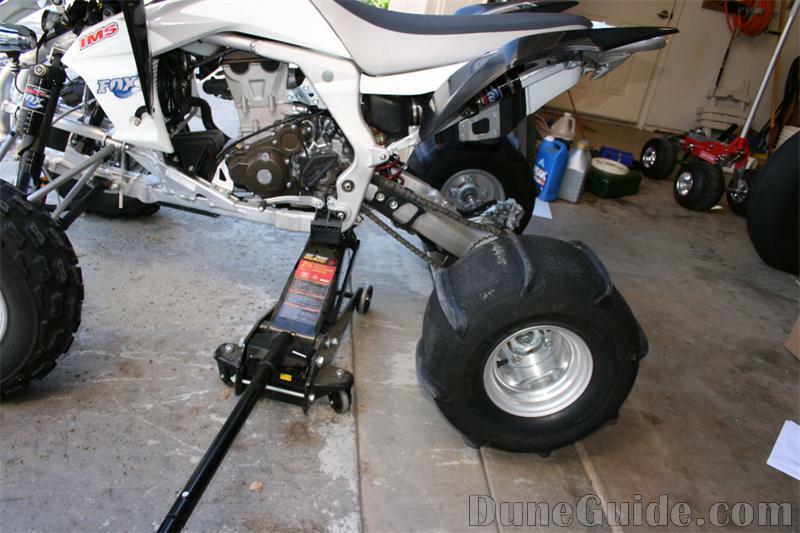 Put the bike up on a stand so that the rear wheels are off the ground and the rear suspension drops out. 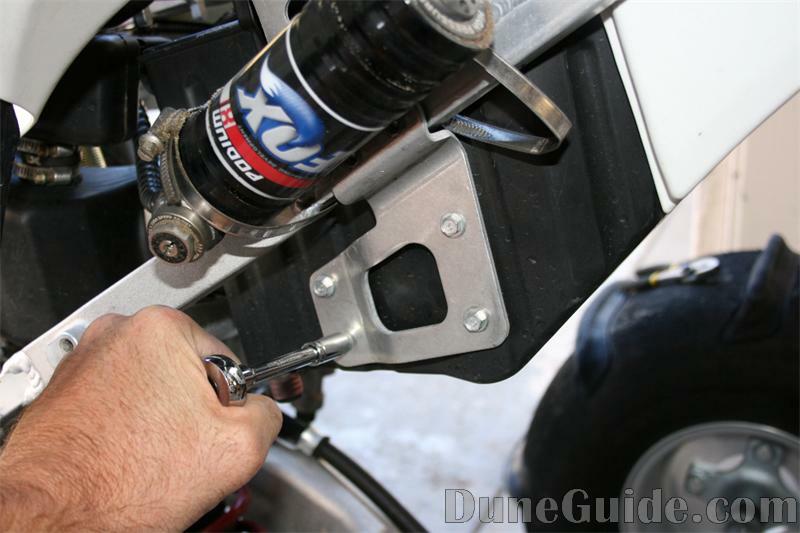 This will ensure maximum intake tube clearance one the intake is properly installed. Remove the rear seat and completely remove the air box. I had to remove my exhaust tip and move my Fox shock reservoir. Carefully remove sensor from stock intake tube. Remove the 2 large hose clamps the connect the stock intake tube to the stock air box. 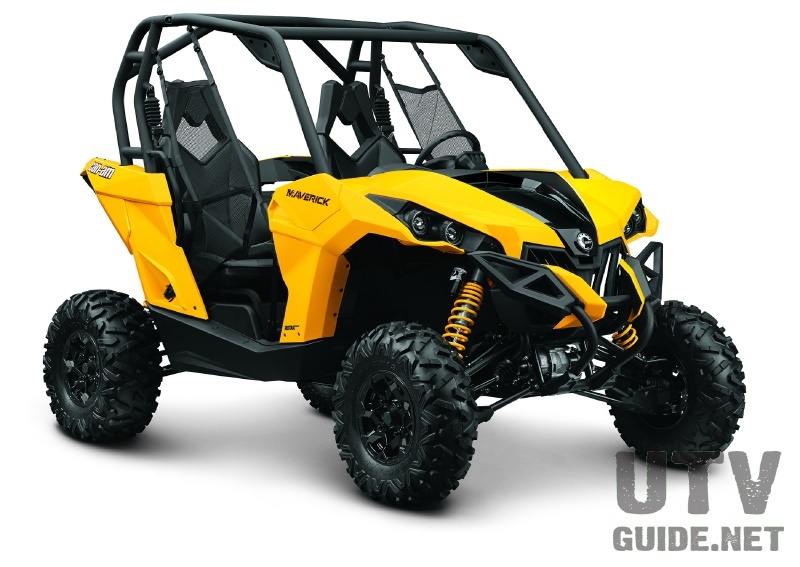 You will use one of these clamps when installing the new Fuel ATV intake. 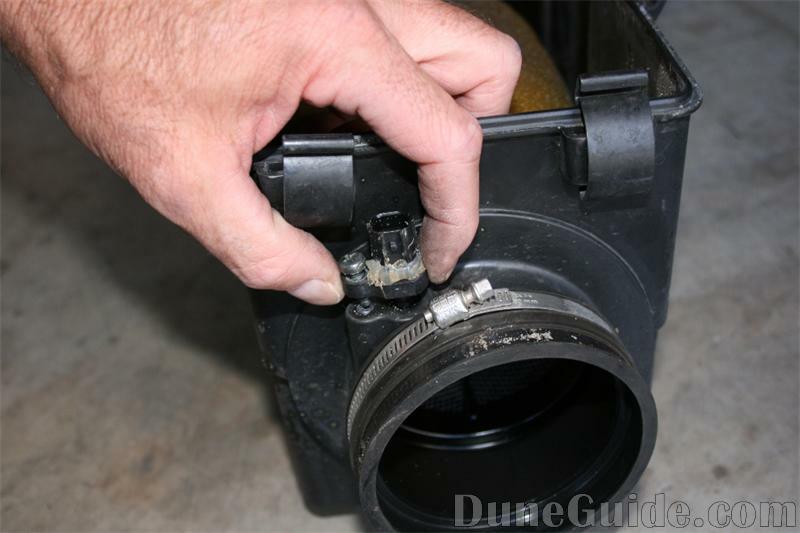 Remove the one small hose clamp that connects the large plastic intake tube to the short rubber intake tube. 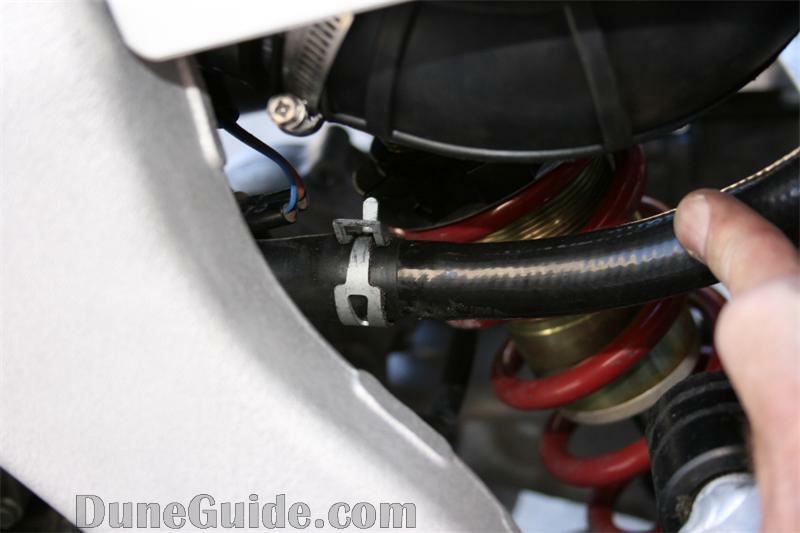 Leave the short rubber intake tube that is attached to the throttle body in place. Disconnect the crank case breather hose from the stock hard plastic intake tube and remove the hard plastic intake tube from the bike. Insert the 1" aluminum spacer into the new intake tube. 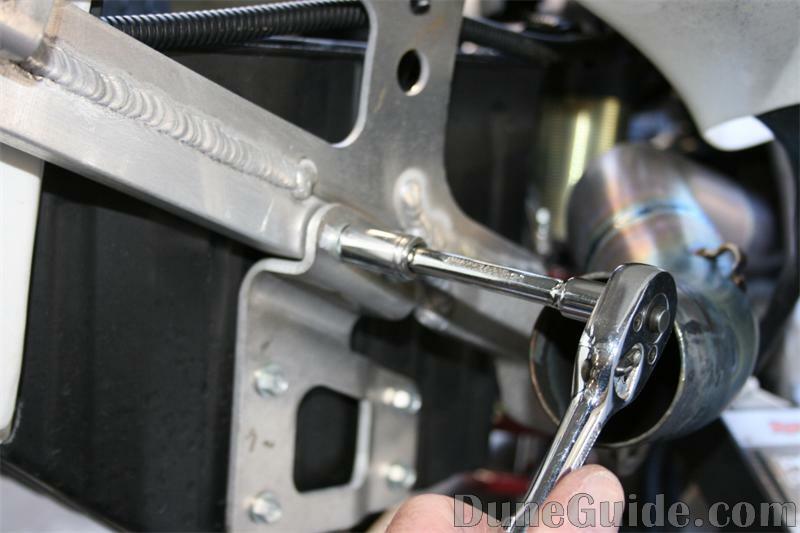 Use the hose clamp that was included with the new intake kit and tighten it firmly. Slide the 1" aluminum spacer into the short intake tube that is attached to the throttle body. Install the stock sensor into the new Black powder-coated intake bracket. Slide the black intake bracket into place. 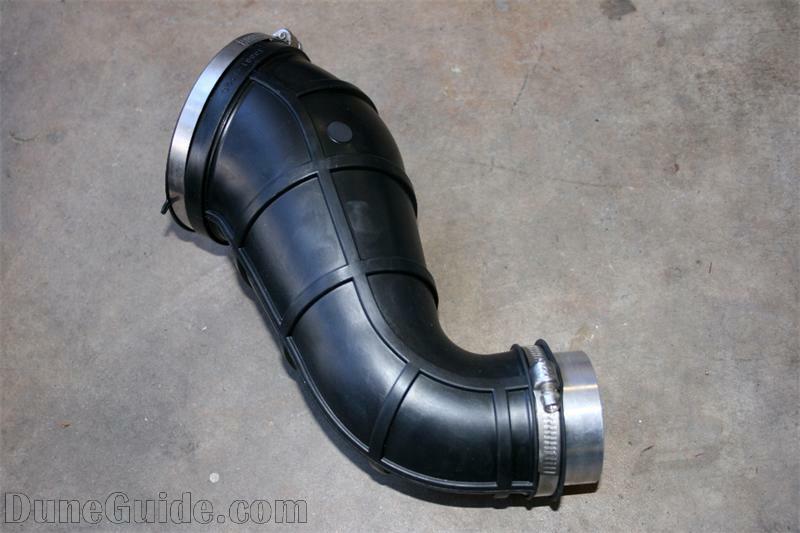 You will use one of the large stock hose clamps to secure the new intake tube to the billet intake adaptor. Now you will have a little room to rotate the new intake tube into the correct position. MAKE SURE THE INTAKE TUBE CLEARS THE REAR SHOCK. Once the intake is in the correct position there will be about 1/4 inch between the shock rezzy and the new intake tube. Again make sure the rear suspension is dropped all the way down and the wheels are off the ground to ensure MAXIMUM intake tube clearance between the rear shock and the intake tube. 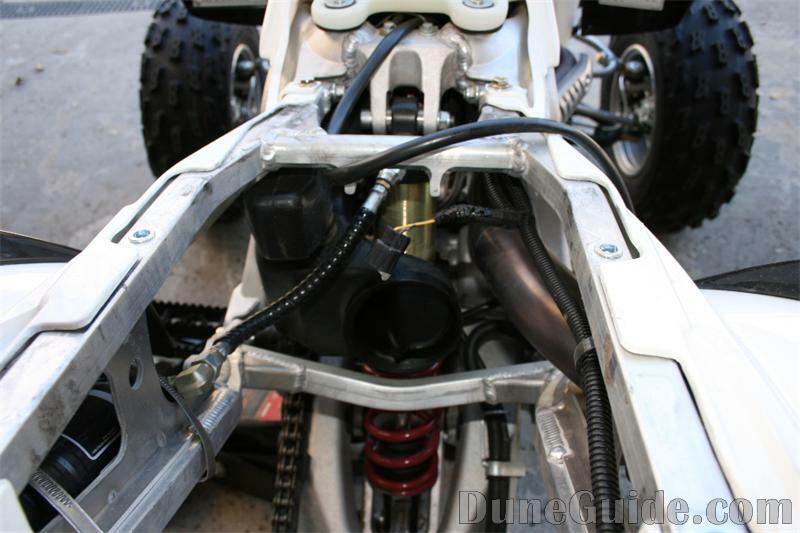 Once the intake tube is in the CORRECT position firmly tighten both front hose clamps. 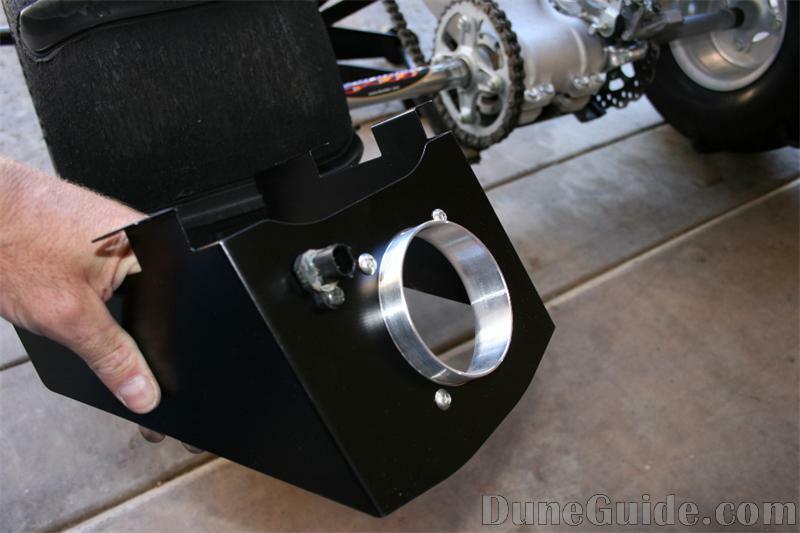 Now use one hand to push the intake bracket forward so that the billet intake adaptor goes into the new intake boot and the other hand to tighten the large hose clamp ...... MAKE SURE THE INTAKE BOOT IS ALL THE WAY AGAINST THE BLACK POWDER-COATED INTAKE BRACKET. Once the tube is installed correctly the intake boot will squeeze in between the 4 small allen head bolts and touch the black intake mounting bracket. 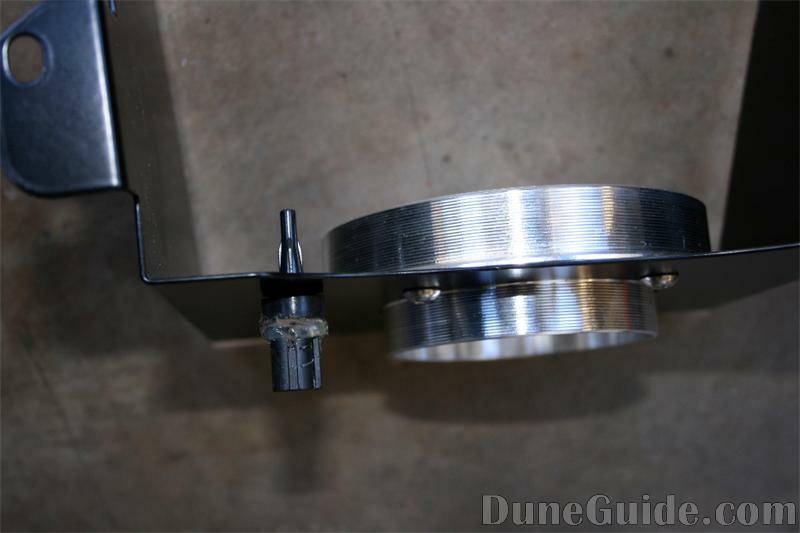 Now you will use the stock air box bolts to attach the new black intake bracket to the sub-frame. 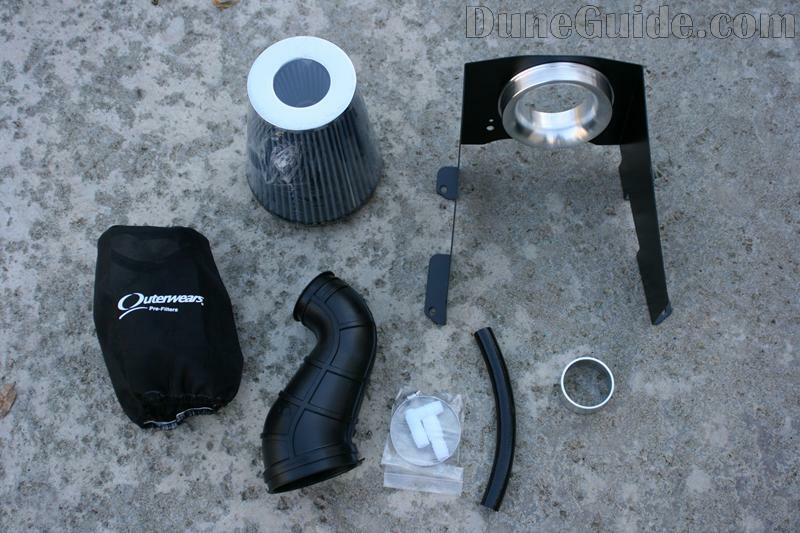 The black intake bracket will slide forward and back a minimal amount. 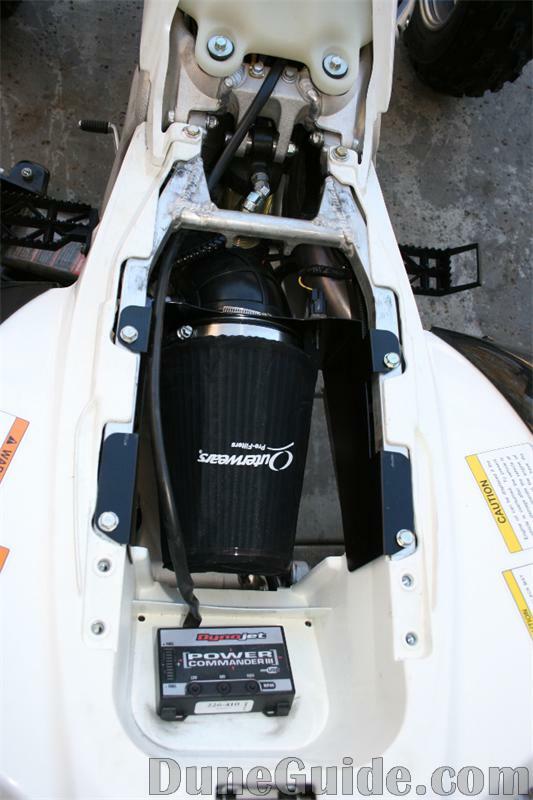 Slide the black intake bracket forward and back to create the most clearance between the new intake tube and the rear shock. Install the 90 degree barbed elbow into the new intake tube and the straight barbed fitting into the stock crank case breather hose. Next install the new rubber hose that is included with the kit. One end on the 90 degree end and the other to the stock crank case breather hose. You may want to trim the hose smaller depending on the hose position. Before you install the air filter slide the seat into place. Look up under the seat to make sure the seat clears and will slide into place. If the seat does not slide into place you can see where the seat pan is hitting the black intake bracket on the left and right side of the subframe. Then you will need to trim 1/8 inch or so off of each side of the plastic seat pan to make it clear. Now install the outerwear onto the air filter and install the air filter into the bike. Check www.fuelatv.com for Power Commander III maps and install new map as necessary. 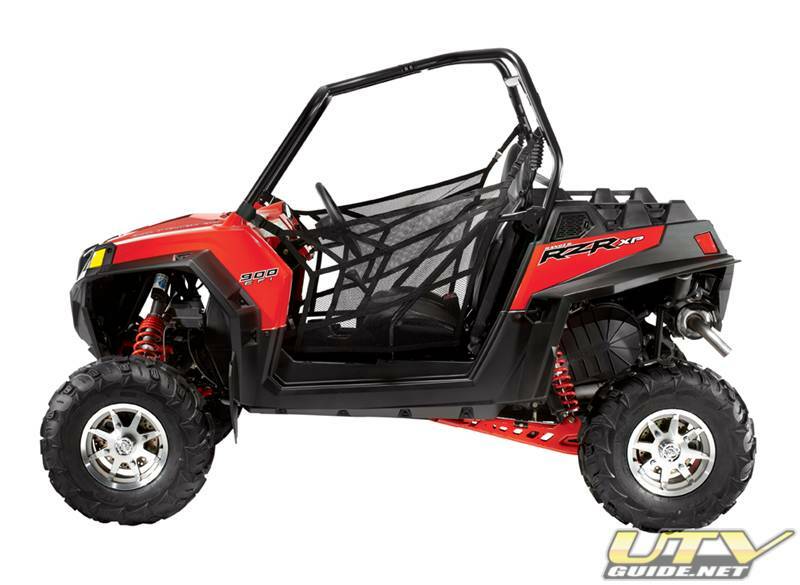 Fuel ATV advertises a 4 horsepower gain with the new intake and I believe it. My seat of the pants dyno says it easily made that big of an improvement. Power delivery is still very smooth, but just pulls even harder. I really like the additional power and the Power Commander III fuel map that Fuel ATV created is priceless.